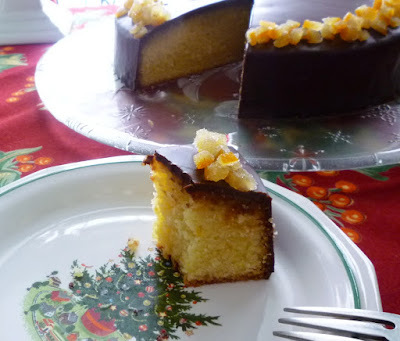 Last year, right before Christmas, I happened across a recipe that looked so good I made it right away even though my baking list for the holidays was already quite long. I served it as part of my family's Christmas Eve buffet. I loved it so much that I made a mental note to make it again for the following Christmas (this year)...and to share the recipe here. Besides being absolutely delicious, the cake—a clementine scented almond cake, cloaked in a dark chocolate glaze—was everything it was advertised to be: light in texture...and an excellent keeper. Under normal circumstances, this last quality wouldn't be a priority....this cake is pretty hard to resist...but at Christmas—when there are so many sweet things to eat—it really is nice to have a cake on hand that slices into beautiful, thin slivers...and also stays moist and flavorful for at least a week. 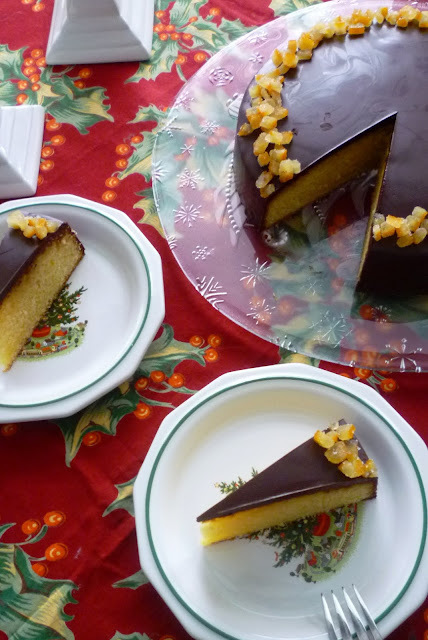 With its citrus and almond flavors...and its longer shelf life, it really is a perfect holiday cake. The source of the recipe is the book Jerusalem (by Yotam Ottolenghi & Sami Tamimi)...although I ran across it in an article on Christmas "puddings" at The Guardian. Anytime I make a cake (or any kind of baked good) from a recipe that has come to me unchanged from another country, I always examine it carefully before attempting it in my kitchen. Ingredients vary—sometimes quite a bit—from country to country and in baking the difference in the size of an egg, the protein content of the flour, etc., can make the difference between success and failure. 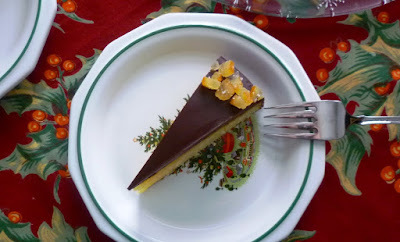 As I examined this recipe, I realized that the ingredient percentages were quite similar to a couple of cakes that are already in my regular repertoire: Amor Polenta and my pistachio cake. 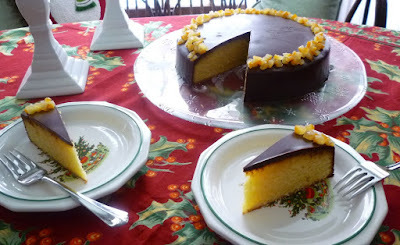 Both of these cakes use cake flour, so I used cake flour instead of the British "plain flour" called for in the recipe. 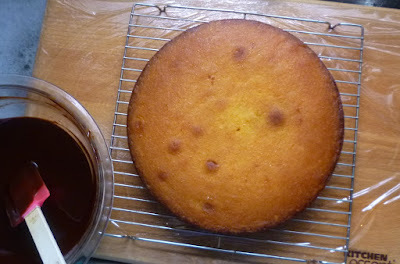 Plain flour is not quite as low protein as cake flour...and plain flour is probably not bleached...but I still felt the cake flour (since it is what I use in the two other cakes) would give a better result than a straight substitution of my normal unbleached, all-purpose flour. The only other change I made was to the method. It is a bit unusual in that the nut flour is creamed into the creamed sugar and butter before adding the eggs, but it is the same way I make the Amor Polenta and the pistachio cake. Since it works well for these cakes, I was fairly certain it would to the same for this cake too. And it did. I realize the holidays are for the most part over...and that many people will be starting their diets tomorrow. 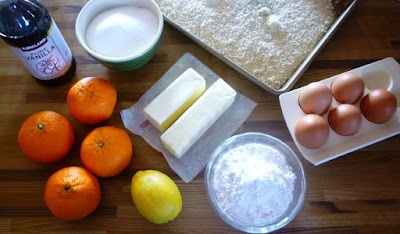 In light of these things, a holiday cake recipe might not be the best post at the moment.... But even if you are starting a diet, the best kind of diet allows you a treat once in a while. I think this cake would make a pretty satisfying special treat. Furthermore, clementines will continue to be in season and delicious for another month or so. During that time I feel confident that there will be many occasions for which this cake would be perfect. And if not, there's always next Christmas. It will be here before we know it. Preheat the oven to 325°. Butter a 9 1/2-inch springform pan and line the bottom with a piece of parchment paper. Butter the parchment. Dust the pan with flour and set aside. Sift the cake flour and salt onto a piece of parchment and set aside. In the bowl of the stand mixer fitted with the paddle attachment, cream the butter until light and fluffy. Add the sugar and zests and continue to beat until fluffy and white, about 5 minutes on medium-high speed. Turning the speed down to low, add the vanilla and almond meal. Increase the speed to medium-high and beat until the mixture is again fluffy—another 2 to 3 minutes. Add the eggs one at a time, beating briefly again on medium-high speed after each addition until the batter returns to fluffiness and scraping down the sides before each next addition. Fold in the sifted dry ingredients. Turn into the prepared pan and bake for 50 to 60 minutes. The cake is done when it is a deep golden brown and a toothpick comes out clean. When the cake is almost done baking, in a small pan bring the citrus juices (you should have about 120ml...don't use any more than this) and another 80 grams of sugar to a boil. Remove from the heat. The moment the cake comes out of the oven, run a thin palette knife around the edge and release the sides. Immediately brush the cake all over with the syrup, continuing until all the syrup is absorbed. Leave the cake to cool completely. 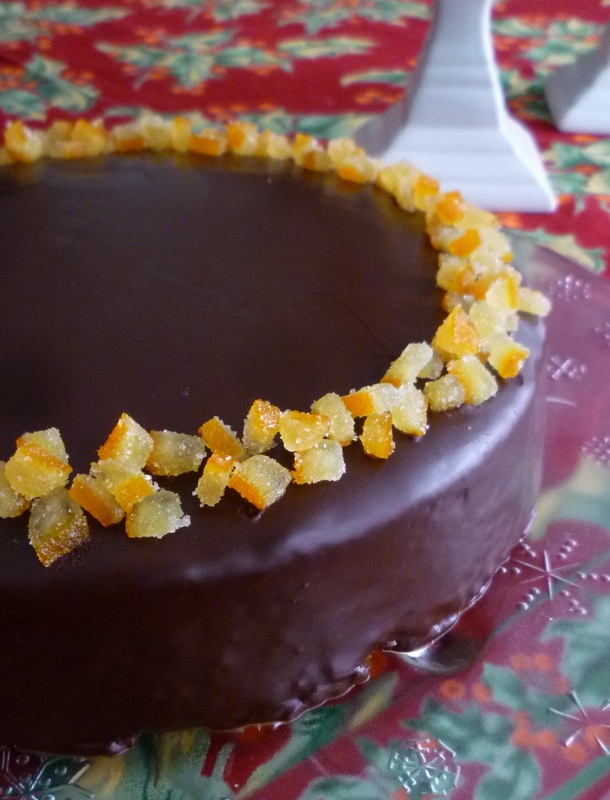 The cake may be served as is, or glazed with a chocolate icing. To make the icing, melt the butter, chocolate and honey together in the microwave or over a pan of barely simmering water, stirring until smooth. Stir in the brandy. Pour the icing over the cooled cake, allowing it to dribble naturally down the sides...it may not cover the cake completely. Allow the icing to set. 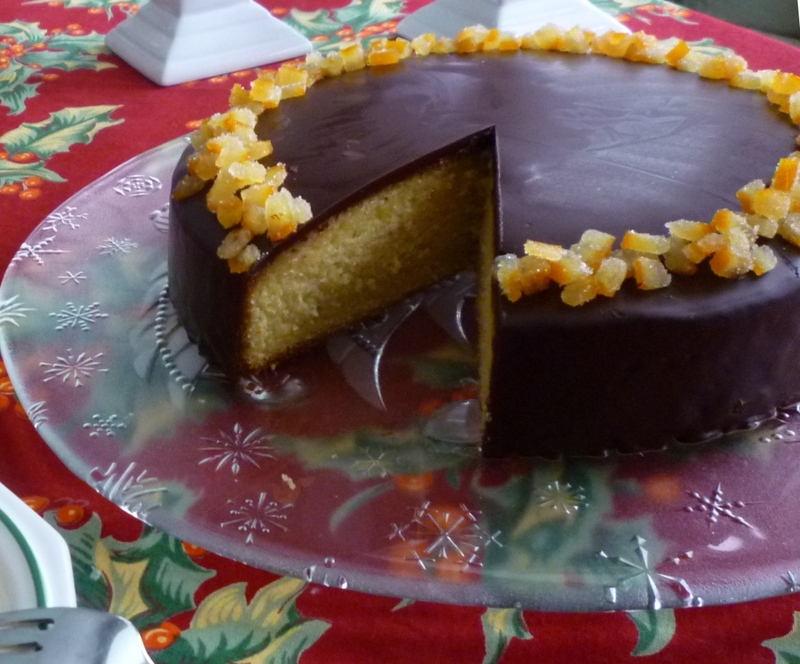 Garnish with diced candied peel, if you like. Note: If you like, you may toast the almond meal. To toast nut flour, spread in an even layer on a baking sheet and bake in a 350° oven until golden and fragrant—about five minutes. Cool before using. Watch carefully—it will darken and burn quickly.